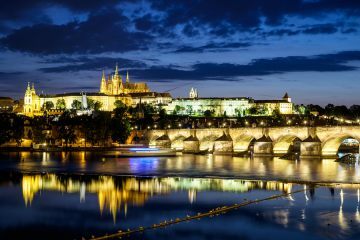 Prague is truly the Heart of Europe and standing guard above the hilly banks of the Vltava River, the Golden Prague Residence lies in the center of it all. 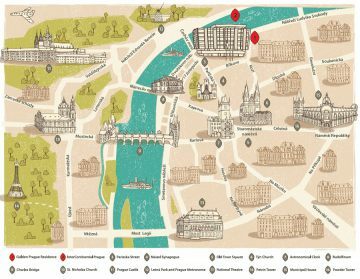 Providing comfort and sophistication in a premier setting, our exceptional apartments offer the ideal base from which to explore this historic city's shops, restaurants, and architectural treasures. Enjoy majestic skyline and river views - just a few minutes' walk from the Old Town Square. Steeped in history and prestige all its own, this stunning Prague city accommodation offers a comfortable haven in a central setting. Golden Prague Residence is located adjacent to the Intercontinental Hotel Prague. Coming From Vienna, Budapest, Bratislava, Brno: Take Highway D1, Brno-Praha, direction Centrum. Exit the Staré Mesto. 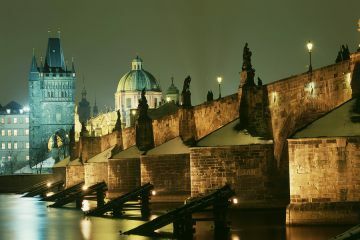 Continue along the Vltava River for approximately one kilometer. The hotel is on your left side. Coming From Berlin: Take Road E55, Teplice-Praha, direction Centrum. Drive along Argentinská Street to the Vltava River. Continue along the Vltava River for approximately two kilometers. Take Nábrezí Kapitána Jarose to the Cechuv Bridge. Turn left at the end of the bridge. The hotel will be in front of you. Coming From Nuernberg: Take Road E50, Highway D5, Rozvadov-Plzen-Praha, direction Motol / Centrum. Drive along Plzenská Street, direction Centrum. Cross the Jiráskuv Bridge and turn left at the end. Continue along the Vltava River for approximately three kilometers. The hotel will be in front of you.